Flown by Captain Charles “Chuck” Yeager, 363rd Fighter Squadron, 357th Fighter Group, November 1944. Includes moving parts and night time textures for the virtual cockpit. Flight model contains a true FS2000 .air file. Engine starts and shut downs work. Sliding canopy activates when gear retracts. Detailed cockpit can be viewed from spot plane view. Pilot’s head turns left and right with rudder movement. This is a fully functional demo model and will be part of a forthcoming commercial release by Blue Arrow. 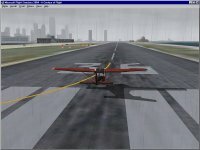 FS2000 sound set is a FlightSim.Com FS2000 Gold Seal Approved sound set. Panel included is a freeware non-commercial release. Visual model by Roger Dial (Blue Arrow FS). Sound by Mike Hambly (Blue Arrow FS). Flight model by Bruce Thorson.